It is definitely fall now. Cool, crisp sunny days. Scarf weather. I find that a scarf makes all the difference between feeling chilled or snug. The garden is still flourishing and I hope that we don't get any frost for a while. 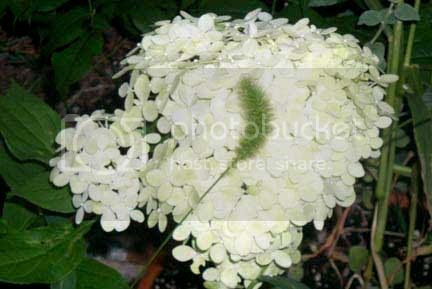 The hydrangea above, Limelight, is one of my favourites. It's blooms are on long branches that poke through here and there, beneath and above the perennials and canes of climbing roses in the bed. At this time of year I have a hard time deciding whether or not to cut and dry the blooms or leave them to brighten the fall garden. I haven't had time to knit this week. Last weekend I got lucky and got three days in a row of on set wardrobe calls. I've never been so happy in all my life to be sewing and not sleeping. I worked on Hair Spray. Those 50s clothes are really starting to fall apart now, which makes a lot of work for people like me. I will post some knitting on KTC later. I'm still looking for a job . This week I started calling on private schools. This is extremely frustrating. I'm actually going to go to the Los Angeles school board presentation and apply there too. posted by Scheherazaad @ 9/29/2006 07:19:00 p.m.
oooooh. i hope to see some of your photos & work. honey, we are longing for scarfweather...but will gladly take the high 80s in the shade instead of the 100s. Dawn, we are not allowed to take any personal photos on set, only continuity. I can photograph clothes off the set. Most of my work is alterations and mending. Funny, I actually got into the business making custom sweaters, but nobody wants those anymore.